Staff File Photo Bradley Square Mall in Cleveland, Tennessee. 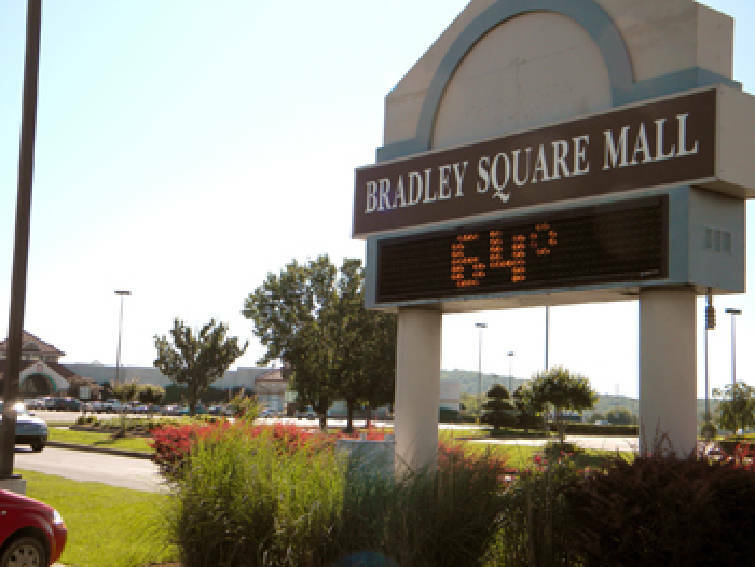 CLEVELAND, Tenn. -- Bradley Square Mall is scheduled to be auctioned at 11 a.m. July 19 in a foreclosure sale at the courthouse. "The mall will still be open for business as usual," Bradley Square marketing manager Jennifer Sparrow said. "There will not be any disruption to either our shoppers or tenants." Ms. Sparrow said the mall has been in receivership since early 2009 but continues to operate under Jones Lang LaSalle retail management, which operates dozens of shopping centers internationally. Ms. Sparrow said she only found out about the sale several weeks ago. She said two other malls owned by the real estate services company also are being sold. Jones Lang LaSalle's Burlington Square Mall in Burlington, N.C., was sold on May 21, she said. The 407,000-square-foot Bradley Square Mall sits on 3,267,000 square feet of land along Paul Huff Parkway, according to the online sales page for the property. Bradley Square Mall shopper Matt Bible said an offer for the building may come from Cleveland's Allan Jones, CEO of Check Into Cash, a payday lending business with locations in 30 states. Ryan Harris, communications manager for Check Into Cash, declined to comment on the possibility of acquiring the mall. In 1998, Mr. Jones bought Village Green Town Center, Cleveland's oldest mall at the time, and turned it into the corporate headquarters of Check Into Cash as well as home to the Cleveland-Bradley County Chamber of Commerce, several restaurants and other businesses. Mr. Bible said he believes the Bradley Square Mall building is worth about $15 million, limiting the number of perspective local buyers. "There's probably only three or four people in Cleveland who can actually afford to buy it," he said.